Wednesday night was a great time to look at where the Buffalo Sabres have been, and where they are going. 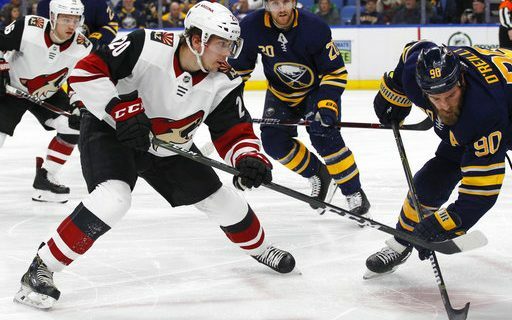 It was almost three years ago to the day from when the Sabres hosted the Coyotes as they were “fighting” for position at the bottom of the NHL standings. The reward for last place was to have a better chance at super-prospect Connor McDavid in the Entry Draft that summer, leaving the odd spectacle of hearing Sabre fans cheer for the opposition. When Arizona scored the game-winning goal, the cheer was one of the loudest for the visitors in team history (non-Maple Leaf division). The Sabres went on to finish last, but didn’t get McDavid – although Jack Eichel wasn’t a bad consolation prize. Here we are, in 2018. The calendar may have flipped a few times, but the situation is very similar. Only the rules for the draft lottery have changed, so that “tanking” isn’t as rewarding as it used to be. Still, the Sabres came into the game in 31st place on Wednesday, and the Coyotes arrived tied for 29th place. Who wants to finish last in a 31-team league? After Buffalo dropped a dismal 4-1 decision, it was still in 31st place. The Sabres are right back where they started in March, 2015. And coach Phil Housley wasn’t happy about one of the team’s most disappointing games of the season. “You manage a schedule to give the group the best energy,” he said. “We didn’t go on the ice yesterday. I didn’t like the response and the energy level. Buffalo’s offense has turned sour for the moment, with a total of one goal to its credit over the last two games. That goal came from Jordan Nolan, who got his first one since Nov. 22. Arizona received all the scoring it needed – two goals – from its power play. Dylan Strome bounced a puck off of the leg of goalie Chad Johnson from a spot beyond the end line for the first goal of the night. Derek Stepan let go a change-up that seemed to float into the net, with Johnson perhaps screened. In the third period, Richard Panik picked up the puck in the slot on a busted play and slipped the puck through Linus Ullmark’s legs (Johnson took a shot just above the eyes and left in the second period). Max Domi finished things with the empty-netter. At least Arizona has shown some signs of life lately. The Coyotes started the season with 12 wins in their first 53 games. Now they’ve won 13 games out of their last 20. If Arizona can survive the lengthy six-game road trip that started Wednesday and will also feature stops in Florida and Los Angeles, they’ll be out of the race for last place soon. The Coyotes are closing in a way that will give them a little hope for the future. Housley could not say the same for his Sabres at this point, even after playing a powerful Nashville team relatively even on Monday night. “That’s where we are as a team,” he said. “We can’t handle any success. And, by the way, we lost that game, 4-0, so you’d think we’d come out like gangbusters at the start of the game. It was a meaningful game because it was for last place in the league. The fans certainly made a statement of their own on Wednesday night. The announced crowd was 17,029, but there were obviously large numbers of no-shows scattered in every part of the building. The idea of No. 29 playing No. 31 on a Wednesday night wasn’t enough for a few thousand people to convince them to use tickets they already had purchased. It’s easy to wonder what those same people will do when the bill for next season’s tickets arrives in the summer.